I travel to South Africa at least once a year, and I’ve flown there a number of different ways, including South African Airways’ nonstop A340 flight in business between New York-Kennedy (JFK) and Johannesburg (JNB), Qatar’s 787 from Doha (DOH) to Cape Town (CPT) in business, Lufthansa first class and Emirates first. On my most recent trip, after another fantastic PeaceJam conference and an amazing safari at Singita Lebombo with my parents I was looking for an interesting way to get home. Once I realized that we’d have a group of four (my parents, TPG reviews editor Nick Ellis and myself), I knew it was the perfect chance to try Qatar’s Qsuite product: specifically its unique “quad” seat. I knew we’d be in for a treat, because Qsuite ended up taking home the award for best international business-class product at the first TPG Awards. Here’s my takeaway from that experience, and some reasons why you should fly this product if you’re with a group. First, make sure your aircraft has Qsuite. If you want to fly Qsuite, the first thing you need to do is check to see if the aircraft you plan to fly has the product on board. The airline is currently rolling the product out to its fleet of Boeing 777-300ERs, Airbus A350-1000s and some A350-900s. If you aren’t sure if the flight you want has Qsuite, you can use ExpertFlyer to find out. Use this post as your guide to figuring out whether your plane will be Qsuite-equipped or not. If your configuration looks like this, it’s Qsuite. If not, there’s a chance you’ll end up in the old 777 business seats, like the ones I flew from Johannesburg (JNB) to Doha (DOH). While they aren’t terrible (they were actually wide enough and I got a decent amount of sleep), they’re a far cry from the new and exciting Qsuite product. Then, call to book all four seats. I booked our quad suite with the help of the Amex concierge that I have access to, thanks to my Centurion card. However, they were unable to book all four seats without calling Qatar directly. The airline blocks off these groups of seats until someone is ready to reserve them all at once. So, once the concierge called the airline explaining that we would be booking all four, they were released. Basically, it takes a little extra effort to book a quad suite — you can’t just hop online and do it yourself — but after we were all seated toasting with Champagne, it was all worth it. I used The Platinum Card® from American Express to purchase all four tickets. Each one cost $2,750, and I earned 5x points on the flights for a grand total of 54,996 Amex Membership Rewards points, which are worth $1,045 according to our current valuations. What was it like to fly the quad suite? After an overnight flight from Johannesburg, it was time to hit the Al Mourjan business-class lounge at Hamad International Airport, Qatar’s home base. When we arrived, it was very crowded, though it did clear out more as it got closer to our flight time. A tip for those wanting to shower while on a layover in this lounge: The main showers often have a long wait, but there’s another set of showers near the quiet room that may have a shorter line, so check both. If I hadn’t gone to the quiet room, I wouldn’t have known about this second set of showers. After freshening up, we headed to our gate. I was ready for the quad suite! The Qsuite cabin is arranged such that you can have total privacy, you can share a “double bed” in the sky with someone, or you can create a massive quad suite that you can share with your family, friends or coworkers. On the 777-300ER, the E and F seats in the odd-numbered rows are directly adjacent to each other. There’s a divider that can be raised to provide privacy for each of these seats, but when it’s lowered, and the seats are fully reclined, they essentially create a double bed — perfect for traveling with a companion. But if you have more than just one travel companion, there’s more you can do. The D and G seats in the even-numbered rows are on the outside, so there’s no opportunity for a double bed there, but if you have two people in the E and F seats facing you, you can slide the “walls” behind the in-flight entertainment screens in order to open up the space. With these dividers open, you’ll be looking right at the two people in the E and F seats across from you. This is exactly what we did when we flew from DOH to JFK, at least for a few hours. With the quad suite fully open, it creates what is basically a table in the middle of the four seats. We used this to drink Champagne and play cards … on an airplane flying at 35,000 feet! If you’re a family of four, the parents can have the inside seats that create the double bed, while two children can have the outside seats. Really, families of all sorts will enjoy this configuration. After all, it’s really just a glorified version of the grandparents’ bed in “Willy Wonka and the Chocolate Factory,” right? 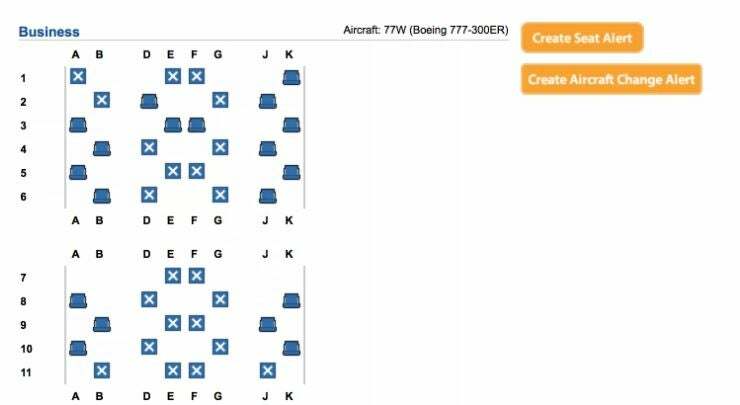 The seats could also easily work for four siblings traveling together; two siblings and their spouses; a family with teens or adult children; or a family with younger kids (just not too young, probably). And the list goes on. Although I was a little concerned about my parents flying “backwards,” it all worked out just fine. It was definitely one of the more memorable flights I’ve had in recent memory. There’s still privacy, don’t worry. While I love my family, I still wanted to get several hours of blissful, uninterrupted sleep — ideally, without playing footsie with Nick, who was sitting next to me. That’s why it was perfect that my parents had the inside seats that turn into a double bed and Nick and I had the two outside seats that were more private. After playing cards and hanging out for a couple of hours at the beginning of the flight, we put all of the dividers back up and voilá, I was back in my private suite with a door that closed. After all, family time is awesome, but sometimes, you just gotta be alone. There was also plenty of entertainment to keep me occupied when I wasn’t sleeping, but still wanted to zone out. Qatar’s Oryx entertainment system featured strong Wi-Fi, and each 21.5-inch IFE touchscreen had thousands of hours of content to keep me occupied. The food’s solid, but not mind-blowing. We ate (and drank) very well on this flight and were certainly satisfied at the end, but the food offerings weren’t up to, say, Emirates first class-level. Granted, Qsuite is a business-class product, but since Qatar only has first class on one aircraft, I thought its food offerings would push the envelope a little more. Qatar served Pommery Brut Royal or Pommery Brut Rosé Royal (the former sells for about $50 and the latter for about $60 on the ground). Qatar offers an à la carte dining program, meaning you can order whatever you want, whenever you want. When flying a Middle Eastern carrier, the Arabic mezze is a must, and Qatar’s was great, though the portion could have been a little bigger. It included several (small) pieces of pita bread, baba ghanoush, hummus and a tabbouleh salad. It all went quick, that’s for sure. I ordered chicken kabsa skewers that were served with yellow lemon rice, vegetables and a tzatziki sauce as the main course. It was delicious and cooked perfectly, but again, I thought it was too small. For dessert, I ordered a cheese plate, which was served with fruit and crackers. Using miles to book Qsuite. You can also use British Airways Avios, Cathay Pacific Asia Miles or Japan Airlines MileageBank miles. Of course, Qatar’s own Qmiles can be used — and the program is a partner of Citi ThankYou — but it’s far from the best use of your points, as there’s no award chart and business-class tickets between the US and Doha often cost around 100,000 miles one-way. Plus, the airline often charges hefty fuel charges for award tickets. I couldn’t agree more with the results of the TPG awards. Qsuite really is the world’s best business-class product. The innovations that the product packs are incredible, the service is always top notch and the food and beverage program is strong. But really, the suite just wows you in the best way possible. There’s no better way to enjoy traveling with your friends or loved ones.